Find how-tos for making these cute ornaments from icing HERE at Food Mayhem. O’ Bakerella, is there any cuteness you can’t conquer? Check out her sparkly, pink n’ white, candy cane Christmas cuppies with how-tos HERE. Check out this cute idea for Santa appetizers from Martha… a great last-minute idea. Here’s a great quick last-minute fix up for mint milanos: candy canes. Find the how-tos HERE at the Hostess with the Mostess blog. A roundup of yummy Christmas goodies from our sister site, CraftBits. 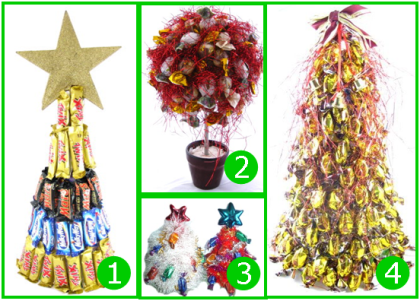 Click the links for the instructions to make all these candy-filled lolly trees. Make creepy eyeball-tinis for your Halloween party. Halloween candy cover ups and pumpkin decorating from Better Homes and Gardens. Learn to make this Jack O' Lantern cake with a video tutorial from Family Fun. Learn to make these witch hat cupcakes at My Sweet and Saucy.